You design the reference form (covered in this article). You include it as a field in one or more of your applications. On the application, applicants submit an email address for their reference person. The reference person receives an email with a link to your form. Once the reference person submits the form, it appears on the student's application for your review. This article describes how to use online reference forms, including how to process responses from reference people. To set up an online reference form, you need to have the Admissions Admin role. Go to Admissions > Settings > Online Reference Forms. Click Add an Online Reference Form. The basic reference form includes three fields: first name, last name, and phone number. You could leave the form as-is (that nets you enough information to make a phone call, anyway), but more than likely you'll want to design a customized reference form. Like applications, online references are made up of three components: headings, text blocks, and fields. Headings and text blocks let you organize and explain the different sections of your reference form. Fields let you collect information from the reference. There are several field answer types (text, integer, yes/no, etc.) that let you ask different kinds of questions as appropriate. You can change or update your reference forms at any time. Keep in mind that changes made to reference forms will not affect any reference forms on applications that have already been started. Click Preview to see how the form will appear to those who'll be filling it out. Click the links at the bottom to add a new field, import a field from another reference form, add a heading, or add a text block. Insert an element between two others by clicking . Click and drag an element to re-order the form. Click Edit to change your field (you can't change the field type). Click to delete the field. To add a heading or text block, just enter your text and click Save. Give the field a name and description. The description will provide instructions for what information to provide about the applicant. 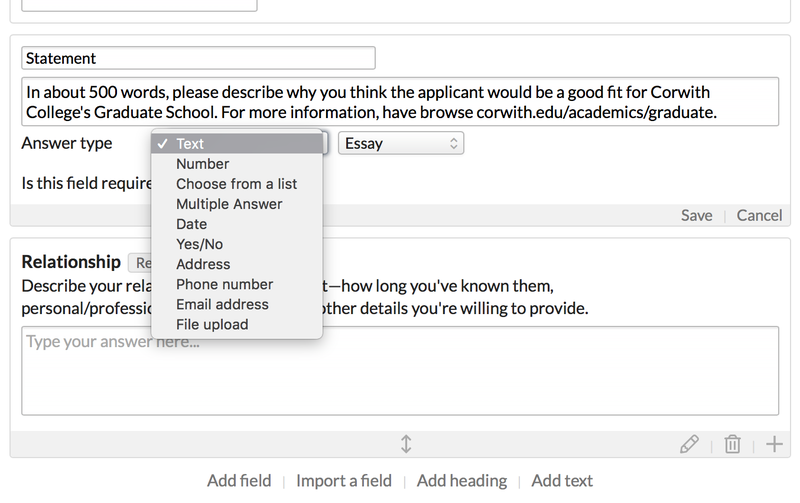 Text: Text fields let you choose from Essay or Short Answer responses. Number: These fields restrict the answer to numerical entries. Choose from a list: Enter options from which the reference may choose a single selection. You can also have them choose a state/province or a country name. Multiple answer: Enter options from which the reference may make one or more selections. Date: Gives the reference person a standard date/time field. Yes/No: Gives the reference two options for an answer. I will let you guess what they are. If you really get stuck, feel free to email Populi Support. Contact fields: Ask the reference for standard contact information. File upload: The reference person may upload a file. Check whether to make this field required. The reference person cannot submit the form without filling in all of the required fields. Importing fields lets you incorporate fields from other reference forms. This comes in handy for commonly-asked questions. Start typing the name of the field you'd like to import. Select the correct field from the results.